Carter & Associates respects your privacy. Across our business, around the world, we will only collect, store and use your personal information for defined purposes. We use your information to support and enhance our relationship with you, for example, to process your applications to register as a customer, provide service and support, and share products, for services with you. We do not sell your personal information. At any time you may contact Carter & Associates with any privacy questions or concerns you may have. You also may ask at any time to see the data you have given us and request correction or deletion. We strive to ensure a high level of security and confidentiality. At Carter & Associates, your right to privacy and data security is our primary concern. Below are the guidelines we use for protecting the information you provide us during a visit to our website. 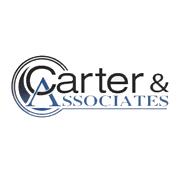 Carter & Associates has no desire or intent to infringe on your privacy while using the Carter & Associates website. Please be aware that other web sites that may be accessed through our site may collect personally identifiable information about you. The information practices of those third-party web sites linked to Carter & Associates are not covered by this privacy statement. We generally use the " " symbol to mark links that go to third-party sites. You are solely responsible for maintaining the secrecy of your passwords or any account information. Please be careful and responsible whenever you're online. If you post personal information online that is accessible to the public, you may receive unsolicited messages from other parties in return. While we strive to protect your personal information, Carter & Associates cannot ensure or warrant the security of any information you transmit to us, and you do so at your own risk. If Carter & Associates's website contains links to other websites that are not operated by Carter & Associates, we are not responsible for the privacy practices of those websites. To opt out of any correspondence or to have your information removed from our database please contact us at (803) 615-5035.